For many women, the decision of when to take a pregnancy test can be a major source of anxiety. Sometimes the stress is because they want to be pregnant. Sometimes it’s because they don’t want to be. For those of you who are worried you’re pregnant (but don’t want to be! ), you may be considering a test because your period is late, or because you think you’re having pregnancy symptoms. Or, perhaps, you’re concerned your chosen method of birth control failed (or you forgot to use contraception). If you're trying to conceive, you may spend the entire two-week wait debating if and when to "pee on a stick." Should you wait until your period is late? What time of day is best? Whether you’re hoping for a negative or a positive result, taking an early test may seem like a good way to find out if you’re expecting right away. Unfortunately, taking the test early may give you a negative result, even if you are pregnant. How do you decide when to resist, and when the right time to take a test is? Does when you take a pregnancy test really matter? The best time to take a pregnancy test is after your period is late. This will help you avoid false negatives and the false positives of very early miscarriages. If you're not already keeping a fertility calendar, proper pregnancy test timing is a good reason to start one. If your cycles are irregular or you don’t chart your cycles, don't take a test until you’ve passed the longest menstrual cycle you usually have. For example, if your cycles range from 30 to 36 days, the best time to take a test would be day 37 or later. Something else to consider is whether you know if your period is even late. According to the FDA, out of every 100 women, between 10 and 20 will not get a positive pregnancy test result on the day they think is just after their missed period, even if they are pregnant. Even tests labeled for early pregnancy detection can't accurately detect a pregnancy before your period is late. The time of day you take a pregnancy test does matter to a certain extent. You’re more likely to get an accurate result if you take the test in the morning. This is especially true if your period is not yet late, or if your period is only a couple days late. At-home pregnancy tests work by detecting the hormone human chorionic gonadotropin (hCG) in your urine. Unless you get up in the night to pee often (or you drink water throughout the night), your urine is more concentrated when you first wake up. This usually means that the amount of hCG is a bit higher, and you’re more likely to get a positive result if you’re pregnant. However, you can still take a pregnancy test in the middle of the day, or even at night. You’re just more likely to get a false-negative, especially if your period isn’t that late, and especially if you’ve been drinking a lot of water and your urine is diluted. Depending on whether a positive pregnancy test would be good or bad news, symptoms like these may fill you with dread…or excitement! But here’s the good (or bad) news: pregnancy symptoms don’t mean you’re pregnant. In fact, you can “feel pregnant” and not be pregnant, or “not feel pregnant” and be expecting. The same hormones that cause pregnancy “symptoms” are present every month between ovulation and your period. Plus, many pregnancy symptoms can be caused by other things, like a cold, the flu, or even a few nights of poor sleep. Knowing how these tests work can help you understand when to take them. As mentioned, the tests detect the pregnancy hormone, human chorionic gonadotropin (hCG), in your urine. Some tests also detect a variation of this hormone, known as hyperglycosylated hCG (H-hCG). The regular hCG is produced only after an embryo implants into the endometrium. H-hCG begins to be released earlier, sometime after fertilization. An at-home pregnancy test can't measure the exact amount of pregnancy hormone in your urine. What it can do is detect whether a minimum amount is present. Getting a negative pregnancy test result doesn't mean your urine doesn't contain hCG. It just means it doesn't contain enough to trigger a positive result. A woman’s level of H-hCG is typically higher than hCG. If a pregnancy test detects H-hCG, you’re more likely to get a positive result early. If a pregnancy test is not sensitive to H-hCG, and only detects regular hCG, getting an early positive result is less likely. Most pregnancy tests on the market are not great at detecting H-hCG. 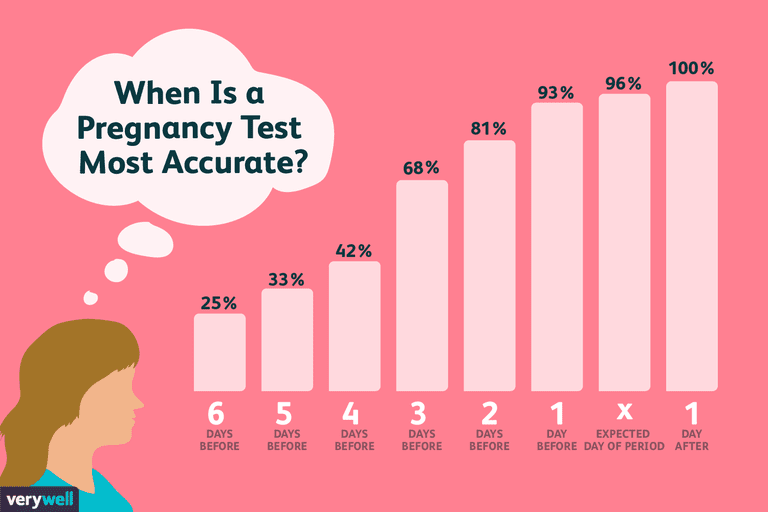 "Early results" pregnancy tests promise results three or four days before your missed period. These tests assume a 14-day luteal phase, which is the time between ovulation and when you get your period. The problem is that you may have a shorter or longer luteal phase. If your luteal phase is usually 12 days, four days before your missed period would be nine days after ovulation. That's way too early to test. For you, taking the test four days before your missed period would be pointless. If you have a luteal phase of 15 days, four days before your missed period is 12 days after ovulation. You still may not have enough hormone that early. However, you have a better chance than someone with a shorter luteal phase. If you're having fertility treatments and you’ve have had an hCG trigger shot like Ovidrel, then you should not take an early pregnancy test. An early test may detect the remains of the fertility medication. If you read the instructions carefully, most tests promise 99 percent accuracy on the day of your missed period—but not for early results. If you expect your period on Wednesday, Thursday would be the day of your missed period. Surprisingly, these promises of 99 percent accuracy may not be true. In research studies, where they compared how much hCG the test claimed to detect and how much it ​actually detected, the tests were only 46 percent to 89 percent accurate. In one study, pregnancy tests indicated a positive result only 80 percent of the time on day 28 of the woman’s menstrual cycle. Are you feeling tempted to take a test before your period is late? Consider the pros and cons before you do. Let's say you want to take an early test, despite the possible downsides. Which test should you use? According to the research, the best early pregnancy test on the market now is the First Response Early Result, or, as it's sometimes abbreviated on fertility forums, the FRER. This is their manual test. The digital test, First Response Gold Digital Pregnancy Test, has previously been reported as less accurate. However, according to a 2013 FDA comparison between the two, the results show the same accuracy. This pregnancy test has clearance from the FDA to say it can detect pregnancy hormones six days before your missed period. That is five days before your period is due. How do these statistics compare to other brands? According to this same study, E.P.T manual tests (not the digital one) detected only 53 percent of pregnancies on the day of a woman's expected period. The First Response Early Results test was more accurate three days before a woman's expected period than E.P.T. 's test was on the day of the expected period. You might be wondering if you should also have a blood test to check if you’re pregnant. It is something to consider if you get a positive or negative result. Your doctor may order a test, or you may be thinking about ordering one yourself. Many labs now allow people to order and pay out of pocket for their blood work. Before you do that, there are a few things you should know. First of all, there are two types of pregnancy blood tests: qualitative and quantitative. Qualitative tests measure whether you have a minimum amount of pregnancy hormone in your blood. (The root word here is quality.) They pretty much give a yes or no answer as to whether you’re pregnant. Or, more accurately, whether you have enough pregnancy hormone to get a positive result. A quantitative pregnancy test measures the amount of pregnancy hormone in your blood. (Here, the root word is quantity.) This is sometimes called a beta hCG test. These are usually done to see how a pregnancy is progressing. For example, your doctor may order a beta hCG test on Monday, and then another test on Wednesday or Thursday. The purpose would be to see whether the level of hCG is increasing as expected or not. This might be important if you had trouble conceiving or have a history of early miscarriage. A blood test isn’t necessarily more likely to give you a positive result earlier. You might think having a blood test will give you faster answers to whether you’re pregnant or not, but this isn’t always true. In fact, there are some qualitative blood tests that require higher levels of hCG for a positive result than some at-home “early” tests. This depends on the lab. In other words, you can theoretically take an at-home test, get a positive result, and have a blood test that same day, and the blood test may come up “negative.” However, you may indeed be pregnant. If your period is late by several days, and you’re still getting negative at-home pregnancy tests, a blood test may be recommended. While rare, it is possible to get a negative test result on an at-home test but still be pregnant. If this is your situation, call your doctor, and don’t just order a test on your own. There are other reasons besides pregnancy that your period may be late. You don’t necessarily need a blood test to confirm a positive at-home pregnancy test. If the at-home test said you’re pregnant, you’re likely pregnant. That said, your doctor might still order one, especially if you request it. The best time to take a pregnancy test is the day after your expected period and in the morning hours, with your first urination of the day. However, when you're anxious to see results, it's understandable if you are tempted to test earlier. Before you reach for that early pregnancy test, carefully consider how you'll feel if the results are negative. If a negative test doesn't bother you, and you have the cash to spend on pregnancy tests, go ahead. If a negative result is going to make your heart ache or if you’d rather not waste money on extra tests, then wait until your period is late. Cole LA. The Utility of Six Over-The-Counter (Home) Pregnancy Tests. Clinical Chemistry and Laboratory Medicine. 2011;49(8):1317-22. doi: 10.1515/CCLM.2011.211. U.S. Food and Drug Administration. 510(k) Substantial Equivalence Determination Decision Summary Assay Only Tempate: k123567, First Response Gold Digital Pregnancy Test. 2013. U.S. Food and Drug Administration. Home Use Tests: Pregnancy. 2017.